Carol Fleisher, left, an award-winning documentary filmmaker, works with Fort Lewis College student Katreena Haswood on Oct. 12, 2017, while filming a documentary about the history of uranium in Durango. The film, “Duranium,” was is part of assistant professor Stacey Sotosky’s Digital Video Production Class. “Duranium,” a film created and edited by Fort Lewis College students, garnered a large turnout last month at the Colorado Environmental Film Festival in Golden. Shawna Crocker, founder of the event in its 13th year, said hundreds of people saw the film throughout the weekend. Students in FLC professor Stacy Sotosky’s Digital Video Production class spent the fall semester researching, shooting and editing the documentary about uranium mining in and around Durango. The project was a partnership with Rocky Mountain PBS. 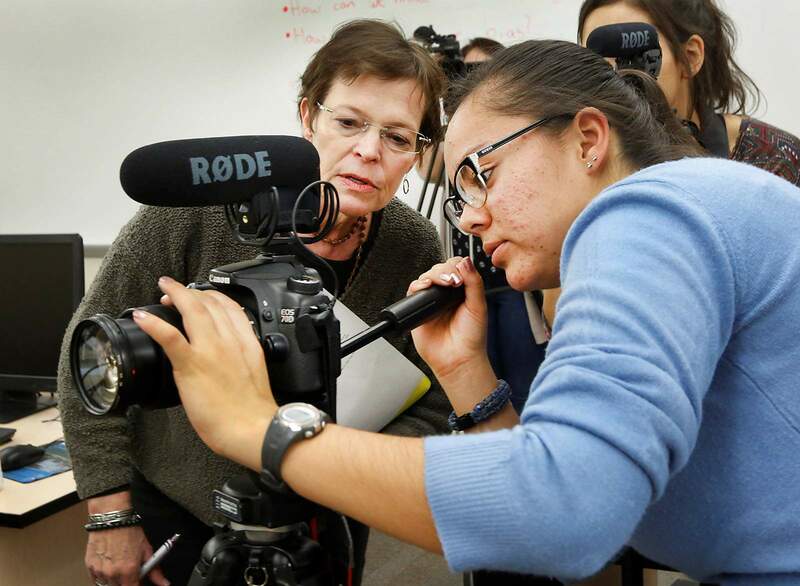 The students received shooting and editing guidance from Durango-based award-winning documentary filmmaker Carol Fleischer whose work has appeared on PBS, NBC, Discovery, National Geographic, among other media outlets. The partnership between FLC and Rocky Mountain PBS is part of a broader effort to bring more localized coverage of the Four Corners to Colorado’s Front Range through the station’s regional innovation center program. The Colorado Office of Film, Television and Media awarded a $5,000 grant to help the effort. Duranium from Stacey Sotosky on Vimeo.